2016 MotoGP World Championship provisional calendar has been announced and the season will begin with Qatar Grand Prix on 20th March 2016 while Indianapolis GP has been discarded and Red Bull Austrian grand prix makes a comeback. British Grand Prix set to take place in July before Czech GP. 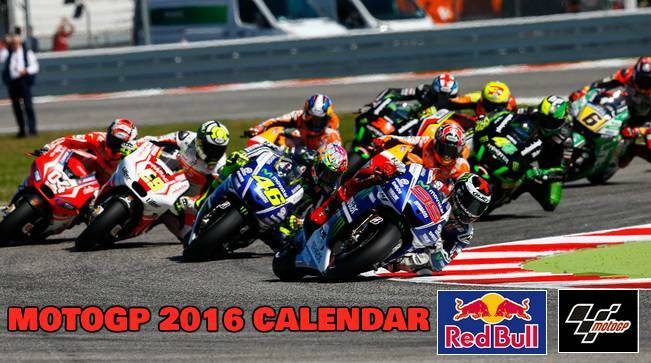 Today 2016 MotoGP Provisional Calendar has been released which will feature 18 races again just like 2015 season. 2016 season will get underway with Qatar MotoGP in Losail on 20th March 2016. Next year Argentina Grand Prix will take place earlier than Grand Prix of America. Last race of the season will be in Valencia on 06 November 2016. Austrian Red Bull MotoGP grand prix makes return on 2016 Calendar and it will take place on 14 August 2016 sandiwched between Grand Britain MotoGP and Czech Republic MotoGP which will take place on 17th July 2016 and 21st August 2016 respectively. American Grand Prix at Indianapolis has been discarded and replaced by Austria MotoGP. Here is the provisional 2016 MotoGP calendar, Not confirmed but its unlikely that we will see any changes in 2016 provisional calendar.